RHYS BOWEN: Hannah Dennison is one of my favorite people in the universe so when I knew she had a new book coming out, I had to snag her for my Jungle Red week. She writes with that wonderful understated British wit about a British countryside we all long to visit. Her new book, HONEYCHURCH HALL is coming out on May 13th and I urge you all to rush to your pre-order buttons. You're in for a fun, delightful treat. from? I get a distinct Downton Abbey feel—are you a big fan? Hannah: I was inspired by my mother’s rash purchase of a wing in a country house in Devon at age 76. When most widows of her advanced years would be heading off to a retirement village, Mum decided that at last she had the freedom to do what she jolly well wanted and there was nothing any of us could do to stop her! She completely reinvented her life and now, at 85, is in robust health, working as a docent at Greenway (Agatha Christie’s summer home) and has never been happier. As for Downton Abbey, who does not love that show! The chance to weave in a contemporary upstairs-downstairs take with “Murder at Honeychurch Hall” was the icing on the cake. Rhys: Your heroine is an antiques expert—how about you? Do you collect antiques? Do you own antique stuffed mice? Hannah: Following my stint as an obituary writer chronicled in my other series – The Vicky Hill Mysteries – I went to work for Leonard Lassalle, an antique dealer who ran a beautiful shop in The Pantiles in Royal Tunbridge Wells, Kent. I absolutely loved that job. He was French and specialized in 17th century English and European furniture, paintings, Delft pottery and treen. Leonard taught me a lot but not about antique toys in which he had no interest at all. In fact, up until I was introduced to the Merrythought Jerry mice by accident (that ended up providing a key clue in the first Honeychurch Hall mystery), I’d never heard of them! On doing some research I subsequently discovered that the Merrythought toy factory in Ironbridge, Shropshire, England produced them in the 1960s and 1970s. The company—eighty years on and still family owned—were licensed to make the MGM Jerry mouse from the Tom and Jerry Show. And honestly, they are really cute and yes, I own two. Rhys: Your books are set in the English countryside—does this England still exist or are you attempting to recreate the England of your childhood/nostalgia or fantasy? Hannah: I wish the England of my childhood did still exist but it doesn’t. Having the opportunity to recreate my memory warms my heart. Honeychurch Hall itself is based on two privately owned residences in Devon—my mother’s home near Totnes and Hillersdon House in Cullompton which is currently being restored—literally—to it’s former glory. Mike Lloyd, my friend and the new owner, has unearthed the original plans dating from the mid-seventeen hundreds and he’s following them to the letter—putting back the lakes, introducing deer, and sprucing up the grotto and stumpery. The ghosts that make an occasional appearance in Honeychurch Hall are all based on those drifting around Hillersdon House. Rhys: The mother—what a fun and awful character. Where did she come from? Hannah: Iris Stanford is a mixture of my own lovely Mum (the good bits), an eccentric old spinster who lived in the village where I was born, and myself! Of course, my mother is not a romance writer of steamy bodice-rippers. In fact I have you to thank for suggesting that Iris have that secret, Rhys! I’ve had a lot of fun writing “excerpts” under Iris’s pseudonym of Krystalle Storm. And if you ask if I share any similarities with my protagonist, the TV celebrity Kat Stanford, I would say a definite no. She’s far too sensible and if anything, reminds me of my own daughter. RHYS: Thank you, Hannah. And good luck with the new series! Hannah will be giving away a copy of Honeychurch Hall so make sure you comment today. Thanks for inviting me today! The more I hear about this book, the more it sounds like a lot of fun. I am going to have to get my hands on it for sure. Merrythought mice are really cute . . . probably because they do not have little beady eyes!!! "Murder at Honeychurch Hall" sounds quite intriguing . . . it's definitely getting added to my to-be-read pile . . . . So much fun to listen in on the two of you chatting! Hannah, how often do you return to England? And do you feel you need to go back to research a book like this, or is it all already in your head? I love the bit about your motter purchasing a country house at the age 76 and being still happy with it. Loving England country and old houses, I find your cover very enticing as well as what you said about your book. Thanks to Rhys for introducing you, I'm always happy to discover new autors to me. Your book goes on my TBR. Mark .... do hope you do!! Joan - The Tom & Jerry Show has just been re-released on TV (last week in fact!) - so the Jerry mice just could become popular again! Lucy- I am lucky to get "home" at least two or three times a year. Even though everything is always in my head, it's the tiny details that can spark a new twist to a story that I see when I am there. Danielle-Yes Mum loves it but it really is impractical. She can't change a lightbulb by herself - the ceilings are too high and she's promised not to go near a ladder. As for the cover - originally we had a Jerry mouse on it but I quite love Mr Chips (the Jack Russell). So looking forward to the book, Hannah! See you next week. This book sounds wonderful - I can't wait to read it! It's always nice to know what was in the author's mind when she/he wrote the book. Thanks for posting this interview. When an author writes with knowledge and affection for a setting, it permeates the whole book with a sense of familiarity for the reader--we feel as though we know this place intimately, too, as if we are part of the landscape, and so, we plunge in immediately, getting to know the characters, coming along for the ride as the plot unfolds. Always happy to discover a new author with that kind of sensibility about their writing! Looking forward to reading your work - sold by the evident sense of humour. My addition to the missing Britain list would be local newsagent/sweet shops, choc full of two of my vices. Hope they still exist! I have a Barnes & Noble gift card burning a hole in my wallet. I think I know what I'm using it on. Honeychurch Hall sounds like my kind of book. Can't wait to get my hands on it. Oooh, I have a B&N gift card, too! What a great idea, Tina Schwab! Hannah, I'm sure I will adore your book. I buy the UK edition of Country Living so I read about people doing up places like Honeychurch Hall. Oh, and love the Jack Russell on the cover, too. Loved the interview Hannah! I will definitely look for your books and the mice. Don't you wish that the good parts of where we grew up could never change. Gosh....so many lovely comments. It's always nerve-wracking writing a new series with new characters. Carole - the village "general store" of Harbertonford (near my mother's house) sells everything from newspapers to jigsaw puzzles -it's also a tiny post-office. But you are right, these places are few and far between. Deborah - I love Country Living too. I also have (on DVD) Ruth Watson's Country House Rescue . Would love to know the English series with antique toys (must look that one up). Pat - Yes - you are right when you say the 'good parts' ... I tend to look back through rose-tinted spectacles! I nearly burst out laughing reading this interview in the library! As soon as I can, I'm looking for your books. I'm pretty sure I'd love ALL of them! Your mother is now my role model for when I reach my mid-seventies! 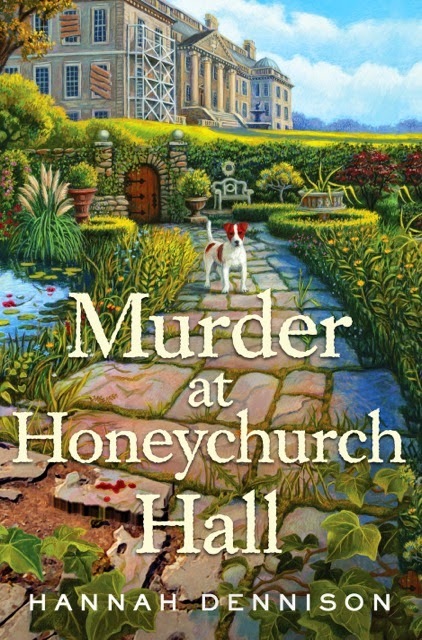 Hannah, this post is a timely one, as just this past week I put Murder at Honeychurch Hall on my Amazon wish list. So, you being here today and discussing it and England is especially exciting for me. I am fascinated with Southwest England, as my ancestors are from Stoke Canon in the county Devon, about five miles from Exeter. The church at which they worshiped, St. Mary Magdalene, is still there, along with the cemetery. I keep thinking that I should write a novel set there, or that might just be my justification for planning a future trip there. Your mother sounds like just the type of elderly dynamo I'd love to be when I arrive at that age. A wing in a country house? Wow! I'm curious, like Roberta, about how often you get back to England and your adventurous mum. How great that you have such a idyllic place to stay when you visit. Thanks again for a post that has me excited about a book and solidifies my resolve to visit England. Any advice on a trip to the much desired southwest area? Rhys, I'd like to go to England and follow you on an eating binge. I like your choices! Well ... Kathy - I know Stoke Canon really well - I suspect I have even been to the church because in my first life (chronicled in my Vicky Hill Mysteries) - I was an obituary writer. I swear that's the truth. I had to stand at the church doors and take down the names of the mourners. If you do decide to go to the West Country - send me an email and we'll talk more. I may well be there! I manage to get back at least twice a year. How does one buy a wing of a country house? Is this a co-op I can join? So happy you are familiar with Stoke Canon and the church there, Hannah. I will definitely email you before my trip, sometime in the next two years. Now, I'm off to go put the Vicky Hill mysteries on my wish list. Oh, who am I kidding? I'm off to order them. Kathy - Great! I hope you enjoy Vicky Hill. I look forward to meeting you in Devon over a cream tea. What a great sounding fun series. I am looking forward to reading this. Sounds like a good new series. Racing in late… What a lovely interview! Such fun to listen in on you two! Hannah -- so excited about your wonderful new series… And I will see you next week! Love the interview and I was fortunate to read this book and I love, love, love it. Looking forward to seeing you next week. Thanks for the enthusiastic comments! Yes -Hank & Dru ... looking forward to seeing you at Malice!